Enjoyment happens when you wake up in the morning and see flowers that weren’t yet bloomed yesterday, now blooming. In ancient Japan, each year is divided into 72 micro-seasons. Within the four seasons of Winter-Spring-Summer-Fall, there are mini changes that occur in every 5 to 6 days, and they create 72 micro-seasons within a year. These small changes include changes in weather, temperature, plants, vegetables including insects and animal that come and go in different seasons. One activity that deeply relates to season changes is a Japanese Tea Ceremony. The Way of tea is so rich in sensation and beauty from nature. In late February, it is the beginning of spring where Plum flowers (Ume) start to bloom, and you can see green birds (Uguisu, 鶯) start to appear. 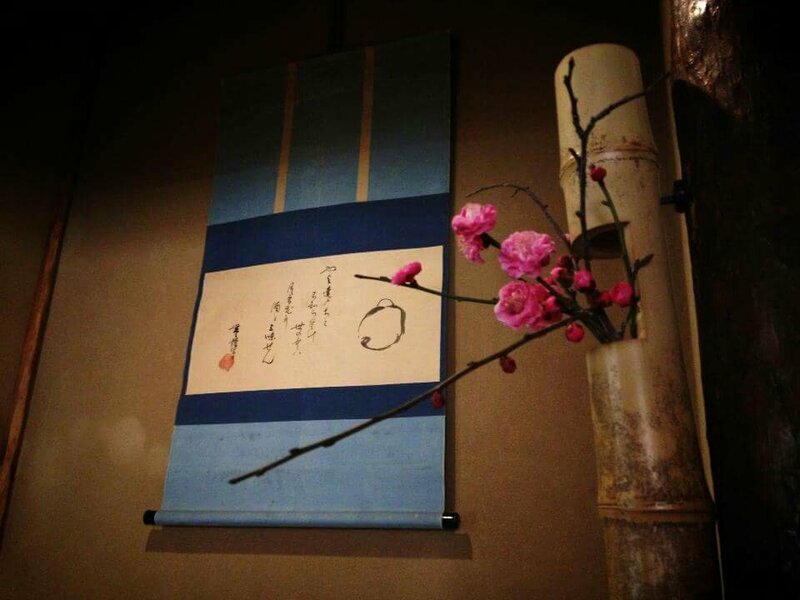 During this season, tea rooms used for tea ceremony is decorated with plum flowers and a written poem hung on the wall that describes the motive of Spring season. For the tea served during the ceremony, apart from matcha green tea, we are also served a Japanese sweet (Wagashi) that is decorated according to the season. The one below is called ひちぎり(Hichigiri) which is in the season of early Spring and Hina-matsuri, a celebration day for girls. Once we enter the world of tea, things are kept to their simplicity and minimalism, allowing our senses to feel the depth of sound, the texture of taste and the transients of events. Marino-san who is the master of the tea ceremony told us to notice the sound of the water when it’s poured into green tea from a certain height, and the sound of bamboo whisk when green tea is prepared. Today is the first time I saw many types of tea bowls at the same place. Every bowl has a story and was made for different functions and aesthetics. I was happy to have witnessed a beautiful event today, and a strong and meaningful friendship that is expressed without words through the Way of tea. Previous “If you want to go fast, go alone. If you want to go far, go together.” —African Proverb.